Research center for informatics revealed the most powerful cluster for AI research in the Czech Republic. We are so proud to be on this project! Ing. Božena Mannová Ph.D. received The Europe Distinguished Leadership Award from 2019 ICPC Foundation. We invite you to the 44th Pattern Recognition & Computer Vision Colloquium organized by the Center for Machine Perception (CMP). We are in the Science! Our WhyCon method was used to localize the swarm robots in an intuitive Human-Swarm Interaction framework. We participate in the prestigious SingularityU Czech Summit! 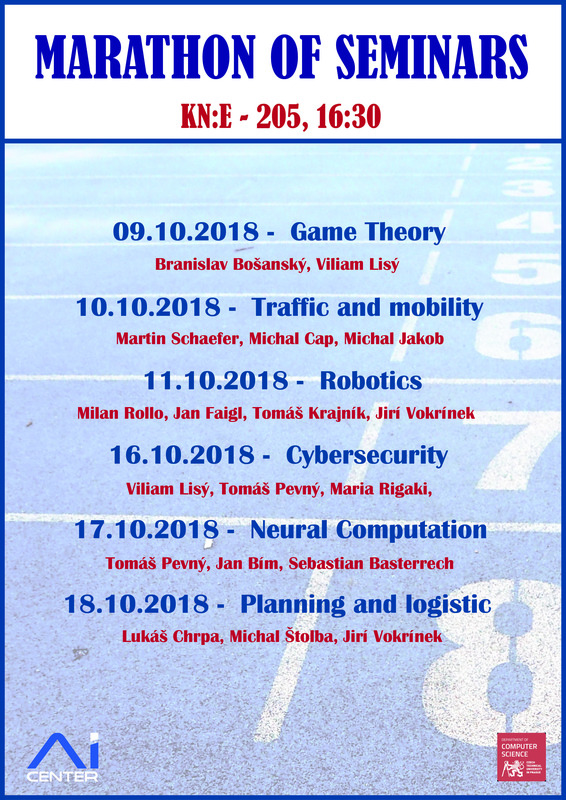 Our researcher Viliam "Vilo" Lisý, who deals mostly with game theory, will talk alongside the greatest Silicon vallery experts. We would like to invite you to the series of seminars. The seminars will be held from 9th of October until 18th of October. From Tuesday till Thursday both weeks, you have the opportunity to come and listen to the leading scientists from the Artificial Intelligence Center. During each seminar, there will be 20 minutes presentation by each speaker, followed by an open discussion where you can ask everything about the research or open positions in our research teams. All students - bachelor and master degree - are welcome. Each seminar will be held in Karlovo náměstí 13, Building E, room nr. 205 and starts at 16:30. We are starting on 9th of October! !